Amazon.com description: Product Description: The NATO Advanced Study Institute 'The Many Faces of Neutron Stars' was the fourth in a series focusing on the astrophysics of neutron stars, which started with the ASI 'Timing Neutron Stars' (QeÃÂ§me, Turkey, April 1988), and ~as followed by 'Neutron Stars, and Interdisciplinary Field' (Agia Pelagia, Greece, September 1990), and 'The Lives ofthe Neutron Stars' (Kemer, Turkey, SeptemÃÂ­ ber 1993). The first ASI had as its theme the main types of observations from which we infer the properties of neutron stars, i.e., the timing of radio pulsars and accretÃÂ­ ing neutron stars in X-ray binaries. The second ASI centered on the interplay between various areas of physics and their sometimes exotic applications to the extreme conditions encountered in neutron stars. In the third ASI the evoluÃÂ­ tionary connections that exist between different types of neutron stars provided the theme of the lectures. During the last several years the number of neutron stars in their various disguises, e.g., millisecond radio pulsars, single neutron star X-ray sources, and soft gamma-ray repeaters has increased substantially, and new phenomena have been discovered in known populations of neutron star systems, e.g., the kHz QPO in low-mass X-ray binaries. 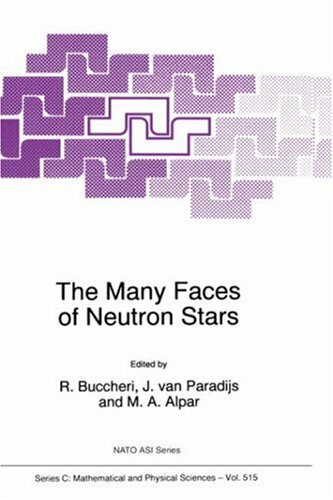 For this reason we have selected 'The Many Faces of Neutron Stars' as the theme of this fourth Advanced Study Institute on neutron stars.